Whitetail DeerWhen Is the Best Time to Deer Hunt? When Is the Best Time to Deer Hunt? Say you only have one precious week’s vacation this fall, and you plan to cash it in chasing whitetails. Schedule accordingly so you're in the woods during the best time to deer hunt. A week’s vacation means one thing to serious deer hunters: seven straight days in the deer woods. For some of us, that might be an outfitted hunt at a fabled deer destination like Illinois, Kansas or Texas. Others might spend that week in the same camp they’ve been returning to year after year. The rest? We might strike out for new territory. Do-it-yourself hunts have a special appeal, particularly when all the pieces fall into place and we notch our tags. Success depends on a number of factors, of course, including one of the most important decisions made in the weeks or months leading up to that moment — when, exactly, should you schedule your hunt? Generally speaking, every state’s deer season can be broken into three segments: early, middle and late. Each offers a number of advantages, but all three present a different set of challenges. As a veteran outfitter and the host of Shoot Straight TV, Chad Schearer has had the luxury of spending much of his life chasing whitetails from first light on the first day of the season to the final minutes of the last day of the season. Choosing a single week isn’t easy, admits Schearer, but he has a special place for the early season. Why not? Deer are in predictable patterns. They live under a false sense of security that comes with eight months without a hunter in the woods. Bucks waltz into crop fields well before sunset and return to their bedding areas at first light day after day. You can almost set your watch by early-season whitetail travel patterns. Schearer’s 11-year-old son Wyatt killed a giant Kansas buck that cut across a bean field at first light as it was heading to bed during the state’s September muzzleloader season. Normally, however, Schearer avoids hunting mornings during the early season. Of course, no one who takes a precious week off during deer season is eager to sleep through the first hour of daylight. As he and his son proved last season, morning hunts can be productive, but only under specific conditions. Schearer, who is also the media relations director for CVA, says everything has to be just right for a productive morning hunt. The wind matters, of course, but more important is where you hunt and how you get there in relation to where the deer are. “Don’t disturb them at all,” he says. Early-season hunts have a few other drawbacks. It’s typically hot, sometimes so hot sitting in a treestand is just downright uncomfortable. Warm weather also means gnats, mosquitoes, ticks and other annoying distractions. In other words, it’s critical to get in your stand early enough that you don’t spook any does or young bucks that might hit the food source early. That means you’ll be in for a long, hot, buggy afternoon in a tree or ground blind. Mornings tend to be a little more comfortable, but even they have a drawback. They’ll move all day during the rut, though. In many states, a mid-season hunt can fall smack in the middle of the rut. What’s not to like about that? Bucks run crazy across pastures and through open woodlots in their quest to pass on their genes to as many does as they can. Sometimes, it can seem downright unfair. It’s not, of course. A mid-season hunt can present its own set of challenges. A buck that runs fearless across your property is also wandering across your neighbor’s property. There’s no guarantee he’ll make it to you before he gets plugged by another hunter. However, it’s by far the most popular time to be in the woods. That popularity is one more drawback, says Chris McClellan, owner of Sailors Creek Outfitters in southern Virginia. Even if a mature buck slips through the gauntlet of rut-crazed deer hunters, you might not see him, either. How many mid-rut days have you sat for hours on end without the first glimpse of a mature buck? Rutting bucks might be dumb, but they aren’t stupid. Pre-rut hunting pressure going back to the first days of the early archery season can push even the most rut-crazed bucks into hiding. The desire to pass their genes is strong, but their instinct to live another day is even stronger. Unseasonably warm weather can also temper rut activity. Bucks will certainly be chasing does, but that might be happening under the cover of a cooler and darker sky. Sooner or later, though, those love-struck bucks will make a mistake. That’s why McClellan is a big fan of the rut. He admits that it’s all but impossible to pattern mature deer, but that’s the beauty of the rut. “You just never know. We kill bucks that we’ve never seen on our trail cameras all season, so even if a few of the bucks on our 4,000 acres get killed by my hunters, there’s a good chance new bucks will show up,” he says. Even better, rutting bucks could appear at any hour. His clients have killed lots of mature whitetails between 10 a.m. and 2 p.m., arguably the worst time to see deer the rest of the season. There’s more to a successful rut hunt than climbing the first suitable tree you find. Rutting bucks might not be working known food sources and they might stay away from known trails, but the does won’t change their normal routines. Find the does and you’ve automatically put yourself at an advantage. Of course, rut activity is often dictated by doe activity. If the does aren’t moving, the bucks might be holding tight with those sedentary females. 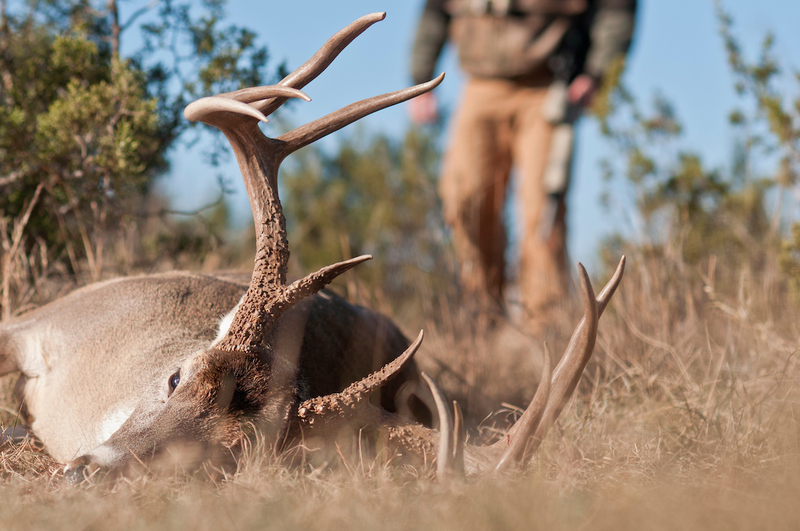 The buck-to-doe ratio also determines how far and wide bucks need to roam. Areas with lots of does might see less visible rut activity. The other drawback to hunting the mid-season? A handful of states protect their bucks by closing the season during the rut. That’s one reason Iowa produces so many trophy-class whitetails — the bucks don’t get hunted when they are most vulnerable. That means your mid-season hunt might fall in that post-rut lull, the period when bucks are hunkered down as they rebuild their strength. They’ll certainly feed, but if they encountered any hunting pressure during the rut, they might wait until dark before they venture out. That’s why the last few weeks of the season might be a wise choice. Things certainly quiet down toward the tail end of the season. The stump-sitters, the guys who hunt more for the fun of deer camp than the thrill of the actual hunt, have thrown in the towel. Other hunters have filled their tag or their freezer and are done for the year. The woods are practically deserted and the bucks might just let their guards down. You’ll have to brave the cold, though. It’s not just cold in late November, December or early January. It can be brutal in some regions where sub-zero temperatures and a constant blanket of snow are the norm. That’s exactly why the last weeks can be the best. Cold weather means one thing to whitetails — how much food can we find? Their late-winter survival depends on a steady diet of foods loaded with carbohydrates. Corn, beans, anything that provides energy draws young and old deer alike. Find the hot food source and you can have those deer to yourself. The last weeks of gun season might not be the best choice in some situations. Whitetails in areas that receive heavy hunting pressure are usually reluctant to travel during daylight hours. It’s not out of the question to spend days without seeing a mature deer if they’ve been bumped around for several weeks. That’s more obvious in regions with abundant and scattered food sources. They don’t need to travel because they have plenty of food just a few steps away from their beds. That’s most obvious in southern states where “cold” means 40 degrees. You might not see big bucks for another, more obvious reason, says Schearer — they’ve already been killed. Bow season, early muzzleloader season and one or more weeks of gun season can put a dent in the deer population. You’ll not only be hunting smarter deer this time of year, but also you’ll be hunting fewer deer.